Lady and the Tramp & Other Lot (Buena Vista, R-1986). One Sheets (2) (27" X 41"). Animation. Starring the voices of Peggy Lee, Barbara Luddy, Larry Roberts, Stan Freberg, Verna Felton, and Alan Reed. Directed by Clyde Geronimi, Wilfred Jackson and Hamilton Luske. Included is a one sheet from The Fox and the Hound (Buena Vista, 1981). Walt Disney productions. 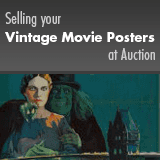 Unrestored posters with good color and overall very presentable appearances. They may have tears, slight paper loss, minor stains, edge and fold wear, creases, pinholes, and/or some fold separation. Please see full-color, enlargeable image below for more details. Folded, Fine+.